Industry Experts released the 2017 version of its global report on In Vitro Diagnostics market. The new report titled ‘In Vitro Diagnostics – A Global Market Overview’ analyzes the global market of In Vitro Diagnostics (IVD) by geographic region, major country and prominent IVD technologies while special citation on end-use sectors in the United States and German markets. Clinical Chemistry is estimated to be the principal technology segment in the global IVD market cornering a market of $19.7 billion in 2017. The In Vitro Diagnostics (IVD) industry is being positively impacted due to several factors that include rising global and regional trends of aging populations, growth in non-communicable diseases and greater affordability for treatment. Due to an increase in healthcare costs, greater weight is being given to evidence-based medicine with the aim of improving patient outcomes. The need for diagnostic devices in various conditions has been growing due to an aging population, growing epidemic of chronic diseases and (re)emergence of infectious diseases. A larger number of people are now gaining access to IVD due to growth in emerging countries and an impetus towards decentralized healthcare. Nearly 68% of the global aged population resides in the developing economies and their population is increasing at a faster rate than that of developed regions. In fact, the population of aged individuals in developed economies has been exhibiting a declining trend, as can be seen from a fall of 38% in 2000 to 33% in 2015, which is likely to continue. This implies that the number of older people in the developing regions will grow over the coming decades. The study analyzes the IVD product types including Reagents & Consumables and Instruments & Systems. This report exclusively analyzes the global IVD technology areas comprising Immunoassay, Blood Testing, Clinical Chemistry, Diabetes Testing, Molecular Diagnostics, Cellular Analysis, Pathology and Microbiology in terms of value in USD for 2014-2022 analysis period in the global markets comprising North America, Europe, Asia-Pacific, South America and Rest of World. The regional markets further analyzed for 16 independent countries across North America – The United States, Canada and Mexico; Europe – (Western Europe and Eastern Europe) Western Europe – Germany, France, Italy, Spain, the United Kingdom, Belgium and Switzerland; and Eastern Europe – Poland, Czech Republic and Romania; Asia-Pacific – Japan, China and India; South America – Argentina and Brazil. 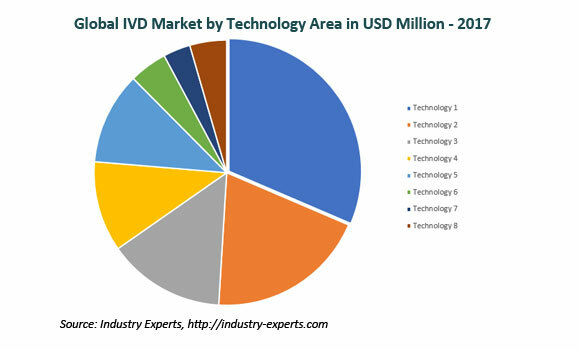 Global IVD market grew from $55.8 billion in 2014 to US$62.6 billion in 2017 and the market is further expected to reach US$83.03 billion by 2022. Molecular Diagnostics is projected to record the fastest growing IVD technology segment with a CAGR of around 8% during 2017-2022 analysis period and to touch US$10.5 billion by 2022. This 498 page global in-vitro diagnostics market report includes 270 charts (includes a data table and graphical representation for each chart), supported with meaningful and easy to understand graphical presentation, of market numbers. The report profiles 13 key global players and 44 major players across North America – 26; Europe – 14 and Asia-Pacific – 4. The study also provides the listing of the companies engaged in IVD industry. The global list of companies covers the address, contact numbers and the website addresses of 335 companies. California, USA based Industry Experts, Inc. is a multi industry focused business information provider.